Foundation leaks seem almost inevitable, but they can be avoided or repaired. We interviewed Paul Sutton and Cassi Sherman of Peak Basement Systems in Colorado Springs about causes and solutions of water problems in concrete basements. Their answers will help you in troubleshooting your own foundation leaks. Q. What causes concrete foundation leaks? Poor grading: “Patios, landscaping, and other outdoor features should all direct water away from your foundation.” Sutton adds that soils compact over time, so grading should be checked and adjusted annually. Weak downspouts: If downspouts are poorly designed or have started leaking over time, they will pool water near the foundation. 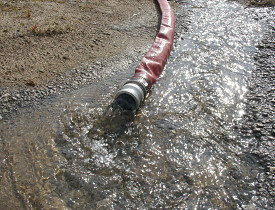 Weak footing drains: “Footing drains installed at the time of construction are prone to premature failure,” Sutton states. These drains are meant to offer long-term peace of mind, but he has seen footing drains blocked with roots, clogged with sediment or physically crushed within five to 10 years of construction. Flooded window wells: Window wells without proper drainage can fill with water and overflow through basement windows. The “clay bowl” effect: Even on a properly graded property, water may pool around the foundation because digging out the foundation leaves weaker soil around the home. Sutton warns that back-filled soil around the foundation is looser and more easily penetrated than the “virgin” soil outside the construction area, which remains compacted and tightly packed, like a clay bowl. Sump pump failure: If you have a sump pump to keep water out of the basement during heavy rains, this backup system needs its own backup system. “Without a secondary backup pump and, preferably, a DC battery-powered backup unit that functions in the event of a power outage, a homeowner can still experience a wet basement.” Sutton advises that sump pumps need dedicated plugs, and a professional electrician should check the wiring. Have the whole system inspected and cleaned out annually. Q. What Should I Do After Finding a Foundation Leak? • Check for submerged wiring and appliances before stepping into a pool of water that could be carrying an electric current. “Personal safety is always first, so make sure you’re not going to get electrocuted,” Sherman cautions. • Confirm the water is a foundation leak, not a broken pipe or sewage backup (in which case, you'll need to find an emergency plumber). • If the basement is flooded, call a remediation company first, then find a waterproofing company to prevent a repeat incident. • If you detect a leak but can’t find the source, call a foundation and waterproofing specialist. Q. How Can I Waterproof my Foundation? • It should be made of rigid material that can’t easily be crushed. • To prevent soil clogs, the drain should sit on the foundation footing, not fill dirt. It should also have holes that release dirt and debris. • The system should allow for inspection with viewing ports. • It should include a flange along the wall that catches water seeping from vertical surfaces. • It should direct water into a sump pump with backup pump, battery backup and an alarm system to alert you when the system is overwhelmed. The pump also needs a heavy-duty cover to prevent falls and reduce both humidity and radon. • The discharge line from the pump should end more than six feet from the foundation, and direct water away from the foundation. It should have a device to prevent freezing, and a safety screen on the end.